Because Winter isn’t over just yet. and a cough rocked the……. chalet? And just what and why would we ever make this concoction. First, it tastes amazing. Second, it smells great and is affordable medicine. Third, it helps those coughs and sniffles. The antioxidant, anti-inflammatory, and anti-bad day properties of Elderberries are staggering. Elderberry, a locally grown food, is one of the best herbal medicines to keep in your cupboard for a snowy day. It’s fun, it’s simple and what better way to spend a day inside and away from the snow. 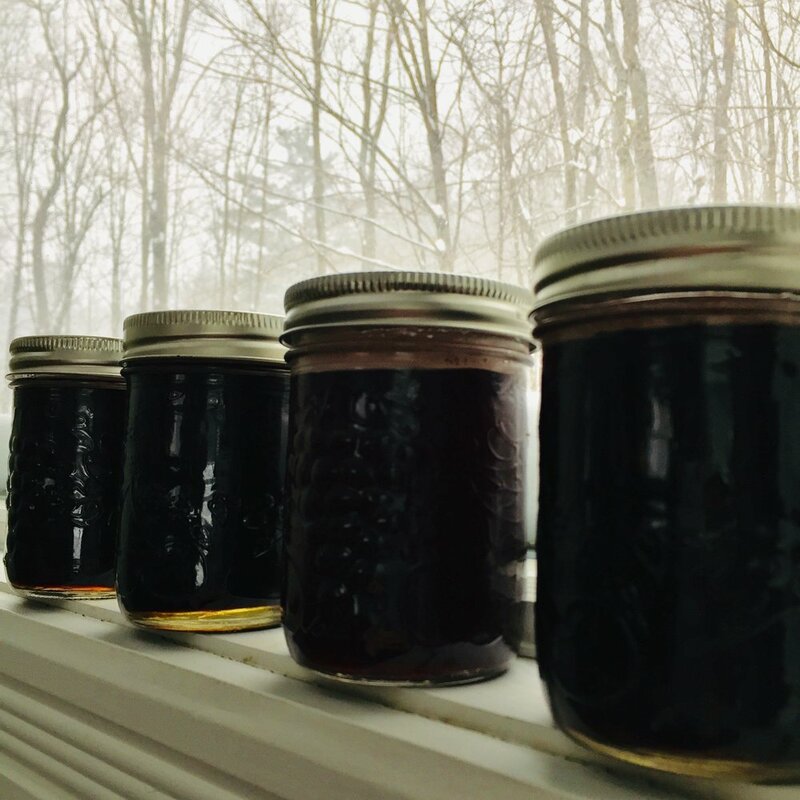 When you are feeling the woes of winter or the changing seasons, why not brew some warm and spicy elderberry syrup. This recipe will make four 250ml jars, keep it in the fridge for future use or spread the love by gifting this handmade delight to your family and friends. Québec company Clef des Champs has some quality organic Elderberries as well as Ceylon Cinnamon sticks. Montréal’s Cha’s Organics has excellent dried whole Cloves. Finally, go with fresh Organic ginger because it’s spicier than the regular ginger. The honey we choose is Miels D’anicet. It is Certified Organic, made in beautiful Quebec and is one of the best honey companies worldwide. Don’t skimp, buy real honey and support your provincial bees. Instructions: Fill the pot with 1 litre of water. Add the elderberries, cinnamon, cloves and ginger. Bring to a boil. Reduce the heat and let it simmer for 45 minutes or until you have about 1/2 the liquid you started with. Let it cool until it is still warm. Now strain it into another bowl. Add that beautiful raw honey and mix gently until well combined. Pour it into the jars and ta da!!! You did it. Winter can now be conquered.